The leaders discussed several bilateral and international issues, including expanding cooperation in the peaceful use of nuclear energy. Modi also invited Putin to visit the Kudankulam nuclear power plant. Russian President Vladimir Putin met Indian Prime Minister Narendra Modi on Tuesday on the margins of the 6th annual BRICS Summit in the Brazilian city of Fortaleza. In a meeting that discussed various bilateral and international issues, the two leaders struck a strong personal cord, informed sources tell RIR. Putin told Modi that he is seen as a friend of Russia, according to Indian Ministry of External Affairs spokesman Syed Akbaruddin. “Even a child in India if asked to say who is India’s best friend will reply it is Russia because Russia has been with India in times of crisis,” Modi was quoted by PTI as saying. According to PTI, Modi said India was committed to taking the relationship forward and the focus is to broaden the strategic partnership in nuclear, defence and energy sectors besides stepping up people-to-people contacts. Very little information from the meeting was immediately divulged by either the Indian or the Russian side, but sources say the leaders spoke about the possibility of Russian gas being piped to India either via China or Pakistan. They add that Putin offered comprehensive measures to raise bilateral trade to around $20 billion. The sides also discussed expanding cooperation in the peaceful use of nuclear energy. In December 2012, the countries agreed to an ambitious roadmap for deepening their cooperation in civilian nuclear energy and construct together 16 to 18 nuclear energy plants in India of 1000 MW each. PTI reported that Modi invited Putin to visit Kudankulam when he is in India next. The Russian president said he thought it was “a good idea,” according to the report. It is unclear whether Russia’s potential sale of Mi-35 helicopters to Pakistan came up in the discussions, but sources say the sides spoke about increasing cooperation in areas of convergence such as Afghanistan and Central Asia. The Indian prime minister was also briefed on the Russian position on the crisis in Ukraine. The BRICS leaders in a signed declaration expressed deep concern with the situation in Ukraine. “We call for a comprehensive dialogue, the de-escalation of the conflict and restraint from all the actors involved, with a view to finding a peaceful political solution, in full compliance with the UN Charter and universally recognized human rights and fundamental freedoms,” they said in the declaration. 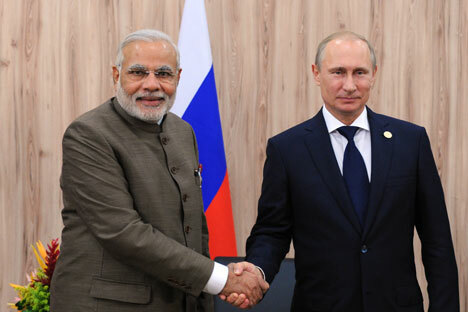 The meeting between Putin and Modi was postponed by a day on account of scheduling glitches. The Russian president’s meeting with his Brazilian counterpart in Brasilia went on for two hours beyond schedule and he could not make it to Fortaleza in time for the meeting with Indian prime minister. Russian diplomatic sources rubbished claims that there were hidden messages with the delayed meeting. “You people need something to fill the pages of your newspapers,” a senior Russian diplomat told RIR when told about the speculation surrounding the delayed talks. Putin is expected to visit India in December 2014 for the annual India-Russia bilateral summit.